IsoLife bv was established on February 8, 2005 as a spin-off company of Wageningen Plant Research, Wageningen UR, The Netherlands. IsoLife aims to expand the number of applications for stable isotopes by developing innovative products with an excellent product quality and a fair price, combined with flexible services directed to tailor-made solutions for you as our customer in science or industry. The management team consists of the two founders, both scientists (PhD) who have combined their individual qualities for the development of IsoLife. In 2002, they took the challenge to start activities for a product company for isotopically labelled plants and phytochemicals, resulting in a winning business plan (BioPartner Biobusiness Masterclass Award 2004). Ries de Visser has worked for 20 years as a plant physiologist/geneticist in Canada and NL and has managed (international) projects with stable isotope applications in ecophysiology and biotechnology. He earned a PhD in biology and studied business administration. His main passions besides IsoLife, are philosophy, skating with friends, gardening on wooden shoes, and his wife and three children (not necessarily in that order). Ton Gorissen started his career in Wageningen as a rhizosphere ecologist in 1986 and got his PhD on carbon allocation to the plants’ rhizosphere, the surroundings of the roots. He managed many projects in soil ecology in which isotope-labelling of plants was a core activity. During more than 30 years he has put much effort in developing the labelling facility Espas (Figure). His personal interests are in sports and games (running, soccer, chess, and family games). Journal of Agriculture and Food Chemistry: 65: 6779-6788. Gorissen A, NU Kraut, De Visser R, De Vries M, Roelofsen H, Vonk RJ. 2011. Beier C, Emmett BA,Tietema A, Schmidt IK, Peñuelas J, Kovács-Láng E, Duce P, DeAngelis P, Gorissen A, Estiarte M, De Dato GD, Sowerby A, Kröel-Dulay G, Lellei-Kovács E, Kull O, Mand P, Petersen H, Gjelstrup P & Spano D. 2009. Carbon and nitrogen balances for six shrublands across Europe. Global Biogeochemical Cycles 23: Article number GB4008, doi:10.1029/2008GB003381. Beier C, Emmett BA, Peñuelas J, Schmidt IK, Tietema A, Estiarte M, Gundersen P, Llorens L, Riis-Nielsen T, Sowerby A & Gorissen A. 2008. Carbon and nitrogen cycles in European ecosystems respond differently to global warming. Science of the Total Environment 407: 692-697. Alberton O, Kuyper TW & Gorissen A. 2007. Competition for nitrogen between Pinus sylvestris and ectomycorrhizal fungi generates potential for negative feedback under elevated CO2. Plant and Soil 296: 159-172. Peñuelas J, Prieto P, Beier C, Cesaraccio C, DeAngelis P, DeDato G, Emmett BA, Estiarte M, Garadnai J, Gorissen A, Kovács-Láng E, Kröel-Dulay G, Llorens L, Pellizzaro G, Riis-Nielsen T, Schmidt IK, Circa C, Sowerby A, Spano D & Tietema A. 2007. Response of plant species richness and primary productivity in shrublands along a north–south gradient in Europe to seven years of experimental warming and drought: reductions in primary productivity in the heat and drought year of 2003. Global Change Biology 13: 2563-2581. Larsen T, Gorissen A, Henning Krogh PH, Ventura M & Magid J. 2007. Dueck TA, De Visser R, Poorter H, Persijn S, Gorissen A, De Visser W, Schapendonk A, Verhagen J, Snel J, Harren FJM, Ngai A, Verstappen F, Bouwmeester H, Voesenek LACJ & Van der Werf A. 2007. Alberton O, Kuyper TW & Gorissen A. 2005. Taking mycocentrism seriously: Mycorrhizal fungal and plant responses to elevated CO2. Van Groenigen KJ, Gorissen A, Six J, Harris D, Kuikman PJ, Van Groenigen JW & Van Kessel C. 2005. Decomposition of labeled roots in a pasture soil exposed to 10 years of elevated CO2. Soil Biology & Biochemistry 37: 497-506. Beier C, Emmett B, Gundersen P, Tietema A, Peñuelas J, Estiarte M, Gordon C, Gorissen A, Llorens L, Roda F & Williams D. 2004. Novel approaches to study climate change effects on terrestrial ecosystems: drought and passive nighttime warming. De Neergaard A & Gorissen A. 2004. Carbon allocation to roots, rhizodeposits and soil after pulse labelling: a comparison of white clover (Trifolium repens L.) and perennial ryegrass (Lolium perenne L.). Biology and Fertility of Soils 39: 228-234. Gorissen A, Van Overbeek LS & Van Elsas JD. 2004. Pig slurry reduces the survival of Ralstonia solanacearum biovar 2 in soil. Canadian Journal of Microbiology 50: 587-593. Gorissen A, Tietema A, Joosten NN, Estiarte M, Peñuelas J, Sowerby A, Emmett BA & Beier C. 2004. Climate change affects carbon allocation to the soil in shrublands. Peñuelas J, Gordon C, Llorens L, Nielsen T, Tietema A, Beier C, Bruna P, Emmett B, Estiarte M & Gorissen A. 2004. Nonintrusive field experiments show different plant responses to warming and drought among sites, seasons, and species in a north-south European gradient. Schönfeld J, Gelsomino A, Van Overbeek LS, Gorissen A, Smalla K & Van Elsas JD. 2003. Effects of compost addition and simulated solarisation on the fate of Ralstonia solanacearum biovar 2 and indigenous bacteria in soil. FEMS Microbial Ecology 43: 63-74. De Neergaard A, Porter JR & Gorissen A. 2002. Distribution of assimilated carbon in plants and rhizosphere soil of basket willow (Salix viminalis). Plant and Soil 245: 307-314. De Visser AJC, Nijhuis EH, Van Elsas JD, Dueck TA 2000. Crops of uncertain nature? Controversies and Knowledge Gaps Concerning Genetically Modified Crops. An Inventory. Report Plant Research International, Wageningen, The Netherlands , No 12, 70 p.
Schnyder H, Schäufele R, De Visser R, Nelson J. 2000. An integrated view of C and N uses in leaf growth zones of defoliated grasses. In: Grassland Ecophysiology and Grazing Ecology (Lemaire G, Hodgson J, De Moraes A, De Carvalho PCF, Nabinger C, eds), CABI Publishing, Oxon, New York, pp. 41-60. ISBN 0 85199 452 0. Gorissen A & Cotrufo MF. 2000. Decomposition of leaf and root tissue of three perennial grass species grown at two levels of elevated CO2 and N supply. Plant and Soil 224: 75-84. Gorissen A & Kuyper ThW, 2000. Fungal species-specific responses of ectomycorrhizal Scots pine (Pinus sylvestris) to elevated [CO2]. Jordi W, Schapendonk A, Davelaar E, Stoopen GM, Pot CS, De Visser R, Van Rhijn JH, Gan S & Amasino RM. 2000. Increased cytokinin levels in transgenic P SAG12 -IPT tobacco plants have large direct and indirect effects on leaf senescence, photosynthesis and N partitioning. Plant Cell and Environment 23: 279-289. Gorissen A & Cotrufo MF. 1999. Elevated CO2 and nitrogen dynamics in grasses with emphasis on rhizosphere processes. Soil Science Society of America Journal 63: 1695-1702. Schnyder H & De Visser R. 1999. Fluxes of reserve-derived and currently assimilated carbon and nitrogen in perennial ryegrass recovering from defoliation. The regrowing tiller and its component functionally distinct zones. Van Ginkel JH, Whitmore AP & Gorissen A. 1999. Lolium perenne grasslands may function as a sink for atmospheric carbon dioxide. Journal of Environmental Quality 28: 1580-1584. Qinghua S, De Visser R. 1999. Root respiration of hybrid rice–Activities of four O_ (2) uptake pathways and apparent P/O ratio. Acta Agriculturae Universitatis Jiangxiensis 22: 313-316. Van Ginkel JH & Gorissen A. 1998. In situ decomposition of grass roots as affected by elevated atmospheric carbon dioxide. Soil Science Society of America Journal 62: 951-958. Warringa JW, De Visser R, Kreuzer ADH 1998. Seed weight in Lolium perenne as affected by interactions among seeds within the inflorescence. Annals of Botany 82: 835-841. Verburg PSJ, Gorissen A & Arp WJ. 1998. Carbon allocation and decomposition of root-derived organic matter in a plant-soil system of Calluna vulgaris as affected by elevated CO2. Soil Biology & Biochemistry 30: 1251-1258. Warringa JW, Kreuzer ADH, Struik PC & De Visser R. 1998. The effect of reduced seed set, nitrogen supply, irradiance, and genotype on seed weight and tillering in plants of Lolium perenne. Australian Journal of Plant Physiology 25: 213-223. Arp WJ, Kuikman PJ & Gorissen A. 1997. Climate change: The potential to affect ecosystem functions through changes in amount and quality of litter. In: Driven by Nature: plant litter quality and decomposition. (Cadish G & Giller K, Eds), CAB International, UK. pp 187-200. Cotrufo MF & Gorissen A. 1997. Elevated CO2 enhances below-ground C allocation in three perennial grass species at different levels of N availability. De Visser R, Vianden H & Schnyder H. 1997. Kinetics and relative significance of remobilized and current C and N incorporation in leaf and root growth zones of Lolium perenne after defoliation: assessment by 13C and 15N steady-state labelling. Plant Cell and Environment 20: 37-46. Van Ginkel JH, Gorissen A & Van Veen JA. 1997. Carbon and nitrogen allocation in Lolium perenne in response to elevated atmospheric CO2 with emphasis on soil carbon dynamics. Plant and Soil 188: 299-308. Elevated CO2 evokes quantitative and qualitative changes in carbon dynamics in a plant/soil system: mechanisms and implications. Plant and Soil 187: 289-298. Gorissen A, Kuikman PJ, Van Ginkel JH, Van de Beek H & Jansen AG. 1996. ESPAS – An advanced phytotron for measuring carbon dynamics in a whole plant-soil system. Plant and Soil 179: 81-87. Magid J, Gorissen A & Giller KE. 1996. In search of the elusive “active” fraction of soil organic matter: three size-density fractionation methods for tracing the fate of homogeneously 14C-labelled plant materials. Soil Biology & Biochemistry 28: 89-99. Van Ginkel JH, Gorissen A & Van Veen JA. 1996. Long-term decomposition of grass roots as affected by elevated CO2 concentrations. Journal of Environmental Quality 25: 1122-1128. Bouma TJ, De Visser R, Van Leeuwen PH, De Kock MJ & Lambers H. 1995. The respiratory energy-requirements involved in nocturnal carbohydrate export from starch-storing mature source leaves and their contribution to leaf dark respiration. Journal of Experimental Botany 46: 1185-1194. Gorissen A, Van Ginkel JH, Keurentjes JJB & Van Veen JA. 1995. Grass root decomposition is retarded when grass has been grown under elevated CO2. Soil Biology & Biochemistry 27: 117-120. Gorissen A, Kuikman PJ & Van de Beek H. 1995. Carbon allocation and water use in juvenile Douglas-fir under elevated CO2. Smeulders SM, Gorissen A, Joosten NN & Van Veen JA. 1995. Effects of short-term ozone exposure on the carbon economy of mature and juvenile Douglas-firs. Bouma TJ, De Visser R, Janssen JHJA, De Kock MJ, Van Leeuwen PH & Lambers H. 1994. Respiratory energy-requirements and rate of protein-turnover in-vivo determined by the use of an inhibitor of protein synthesis and a probe to assess its effect. Gorissen A, Joosten NN & Burgers SLGE. 1994. Ammonium deposition and the mycoflora in the rhizosphere of Douglas-fir. Soil Biology & Biochemistry 26: 1011-1022. Gorissen A, Joosten NN, Smeulders SM & Van Veen JA. 1994. Effects of short-term ozone exposure on the carbon economy of juvenile Douglas-fir. Ammerlaan FHM & De Visser AJC 1993. Effects of CO2 enrichment on photosynthesis and carbohydrate utilisation: consequences for regrowth of Lolium perenne. In: Climate Change; Crops and Terrestrial Ecosystems (Van de Geijn SC, Goudriaan J & Berendse F, eds),. Agrobiological Themes 9. CABO-DLO. Wageningen. pp. 1-22. ISBN 90 73384 176. Bouma TJ & De Visser R. 1993. 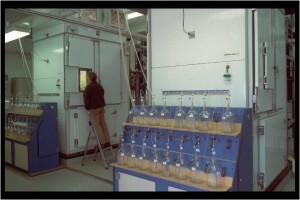 Energy-requirements for maintenance of ion concentrations in roots. Gorissen A, Jansen AE & Olsthoorn AFM. 1993. Effects of a two-year application of ammonium sulphate on growth, nutrient uptake, and rhizosphere microflora of juvenile Douglas-fir. Plant & Soil 157: 41-50. Bouma TJ, Spitters CJT & De Visser R 1992. Variation in leaf respiration rate between potato cultivars: effect of developmental stage. In: Molecular, Biochemical and Physiological Aspects of Plant Respiration (Lambers H and Van der Plas LHW, eds), SPB Acad Publishing, The Hague. pp. 512-522. ISBN 90-5103-079-7. De Visser R, Spitters CJT & Bouma TJ 1992. Energy cost of protein turnover: theoretical calculation and experimental estimation from regression of respiration on protein concentration of full-grown leaves. In: Molecular, Biochemical and Physiological Aspects of Plant Respiration (Lambers H and Van der Plas LHW, eds), SPB Acad Publishing, The Hague. pp. 493-508. ISBN 90-5103-079-7. De Visser R & De Kock R 1991. Variation in leaf respiration rate: Light and temperature responses of photosynthesis in four ryegrass clones differing in productivity. In: Fodder Crops Breeding: Achievements, Novel Strategies and Biotechnology (Den Nijs APM and Elgersma A, eds), Pudoc, Wageningen, pp 69-70. ISBN 90-220-1029-5. Gorissen A, Joosten NN & Jansen AE. 1991. Effects of ozone and ammonium sulphate on carbon partitioning to mycorrhizal roots of juvenile Douglas-fir. Gorissen A, Schelling GC & Van Veen JA. 1991. Concentration-dependent effects of ozone on translocation of assimilates in Douglas-fir. Journal of Environmental Quality 20: 169-173. De Visser R, Dekhuijzen HM & Verkerke DR. 1990. Control of seed respiration and growth in Vicia faba by oxygen and temperature: no evidence for an oxygen diffusion barrier. Gorissen A & Van Veen JA. 1988. Temporary disturbance of translocation of 14C-assimilates in Douglas-firs caused by low levels of ozone and sulfur dioxide. Frinking HD, Gorissen A & Verheul MJ. 1987. Dissemination of spores in a glasshouse: pattern or chaos? International Journal on Biometeorology 31: 147-156. De Visser R, Brouwer KS & Posthumus F. 1986. Alternative path mediated ATP synthesis in roots of Pisum sativum upon nitrogen supply. Efficiency of respiration and energy requirements of N assimilation in roots of Pisum sativum . Hofstra RJJ, Lanting L & De Visser R. 1985. Growth and metabolism of Urtica dioica L. as dependent on the supply of mineral nutrients. De Visser R & Poorter H. 1985. Growth and root nodule nitrogenase activity of Pisum sativum as influenced by transpiration. De Visser R & Blacquière T. 1984. Inhibition and stimulation of root respiration in Pisum and Plantago by hydroxamate. Its consequences for the assessment of alternative path activity. Blacquière T & De Visser R 1984. Capacity of cytochrome and alternative path in coupled and uncoupled root respiration of Pisum andPlantago. Lambers H, Szaniawski RK & De Visser R. 1983. Respiration for growth, maintenance and ion uptake. An evaluation of concepts, methods, values and their significance. De Visser R & Lambers H 1983. Growth and the efficiency of root respiration of Pisum sativum as dependent on the source of nitrogen. Feenstra WJ, Jacobsen E, Van Swaay ACPM & De Visser AJC. 1982. Effect of nitrate on acetylene reduction in a nitrate reductase deficient mutant of pea (Pisum sativumL.). Feenstra WJ, Jacobsen E & De Visser AJC. 1981. Isolation of a nitrate reductase deficient mutant of pea (Pisum sativum) and its use in the study of the inhibiting effect of nitrate (NO3–) on nitrogen fixation. In: “Induced Mutations – A Tool in Plant Research”. Proc. Symp. IAEA/FAO, Vienna , 327-331.